Shapeways is a great 3d print on demand service. 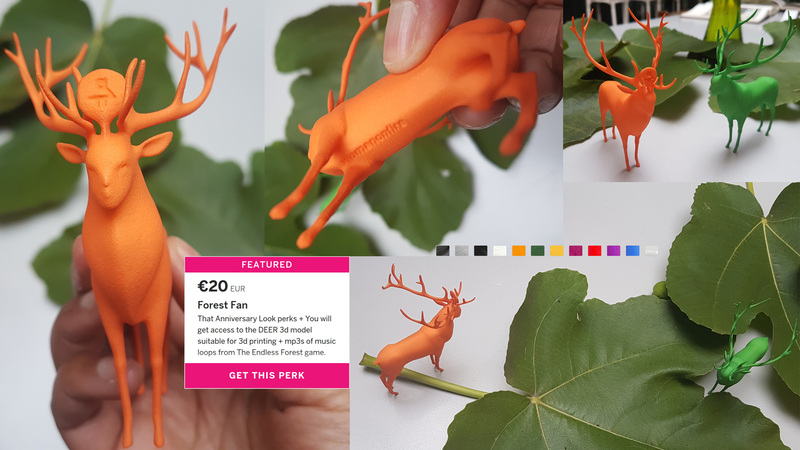 When we send you access to the model, you have to pay for the print and currently it costs around 50 Euro, I will see if I can't make it use less material to get it under 40. The other deer are only 18! 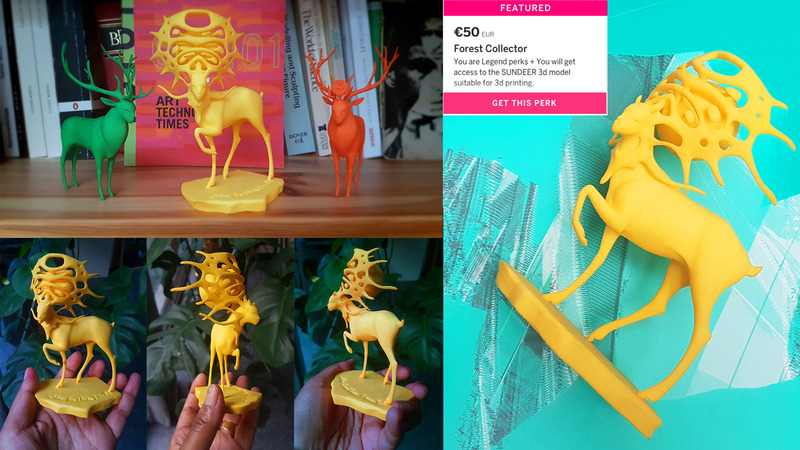 Those of you who've pledged are wondering what the Tin Deer is all about. I don't generally draw the pelts and masks before I make them, so I was wondering how I could show you something before the campaign to support The Endless Forest ends on December 27th. 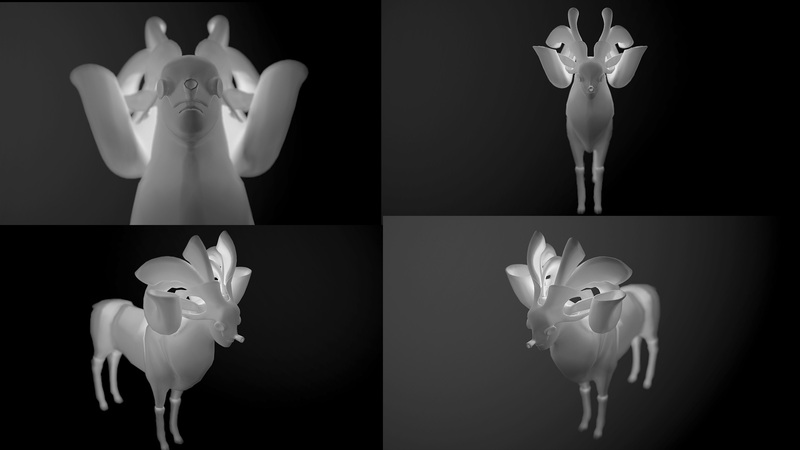 I decided it's simplest just to show you some renders of the work in progress! It's not done yet of course, and how it will be textured I leave up to your imagination for the moment. He's kinda got a goggles and horns semi-steampunk thing going on. If we can get enough to remake the game in Unreal engine, there are so many cool things we can do texture-wise that are simply not possible in the 2005 game engine the Forest is in now. We can make metal look like metal! We can make things *really* glow! We can have amazing particle effects! I look forward to making stuff that goes beyond all our dreams, makes them real!, and then makes us dream new dreams! The Endless Forest is 10 years old today! Ten years ago today, on 10 September 2005, the first phase of The Endless Forest was launched at a fine art exhibition entitled "Tardis" that took place on the ruins of a medieval abbey. The gothic Saint Salvator church that was part of the abbey served as the floor plan for the well-known ruin in our deer Forest. The game was actually based on a prototype that had been made in response to a commission from the Museum of Modern Art in Luxemburg in 2003. This prototype was presented in its online gallery in 2004. MUDAM would continue to host the server for the game until 2012. 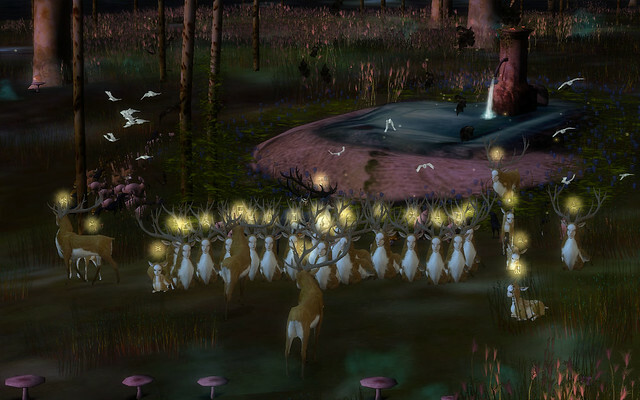 The Endless Forest is the first game released to the public by Tale of Tales. Over the years that followed, the game has been expanded to its current form. Each iteration of its development has been supported in part by the Flanders Audiovisual Fund and Design Flanders. 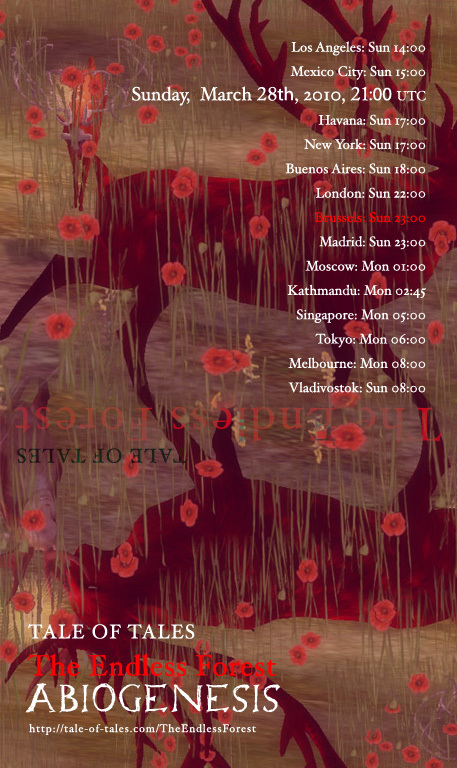 Additionally, Phase Two was created with the support of the STUK Arts Centre in Leuven and released in 2006. And Phase Three with the support of Rasa in 2007. Since then a few smaller additions were added such as Halloween for the Velocity Festival in 2007 and De Drinkplaats for an exhibition in the Broelmuseum in 2009. As the game continued to draw players (20,000 registered deer by 2007, 50,000 by 2009, and almost 170,000 today), we've had to add new generations of pictograms to identify players in this wordless game. Thanks again for being so wonderful! We were really happy with the designs you all came up with. We continue to count oursleves lucky to have so many great players who care about the Forest! Enjoy the new sets! The Twin Gods will be around in the forest to surprise you! 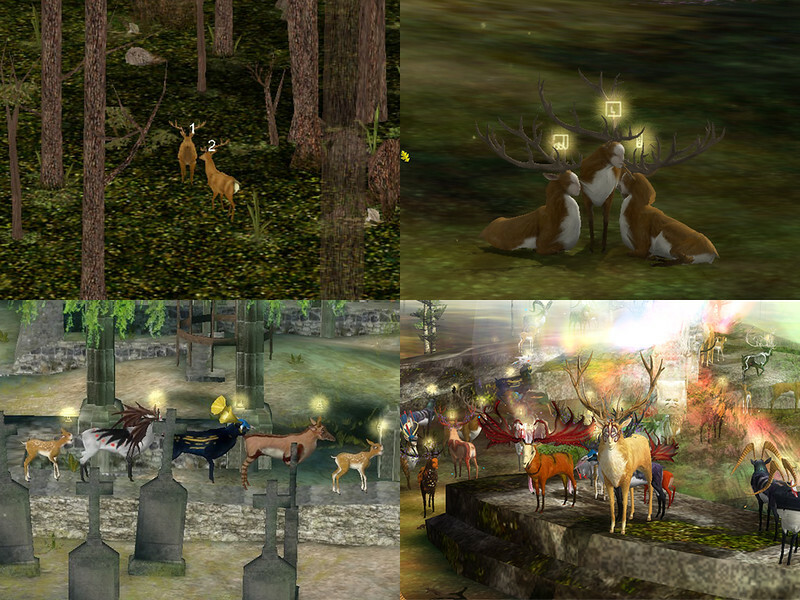 Thanks to players like you we have been able to keep The Endless Forest online and absolutely free for everyone. Since we lost our funded support of the multiplayer servers we have depended on the community to help us with the ongoing charges and maintenance of The Endless Forest and we are happy to say this has been largely successful! It seems like this place is more popular than ever, the spirit of the project lives on! Running a multiplayer environment is not cheap. And though Michael and I have moved on to other projects that take our attention away from this game, we love The Endless Forest as much as you do and want to keep it online forever if possible. So, if you haven't already, please consider a one time donation or an ongoing subscription. And even if you cannot donate, Thank you for playing and making The Endless Forest such a special place! This is your community, be good to one another. We do not police the community and we're proud to say that for the most part everyone gets along. This makes us happy as the creators of the joyful, calm experience that The Endless Forest is meant to be! On this site, if conflict arises, please find a way to solve it and don't sow strife. One way to be courteous to one another is to give credit if you post an image or use a picture that someone else has made. In other words, don't make someone mad by claiming their words or images as your own. Give credit and make friends by mentioning the name of the creator, and if you do not know where an image came from, say so, and ask if anyone else knows who the author is. Its just good manners. our advice is usually: solve the problem, have a good time, be good to one another. Alright, for those who know what went wrong the other day... Just letting you know, it all _should be alright again. Please proceed with your usual blogging, biography-ing, storytelling, and picture posting. If you notice anything wonkier than normal, something not working the way it used to and you want it back, please email me and Michael and let us know - the.endless.forest at tale-of-tales.com - I'll check the comments on this post for a few days too. I know the site is not perfect but its yours. And we do our best to keep it up and running for you. I am fiddling with the site. It may cause things to be.... odd for a little while today. Nothing like a little party to end our anniversary celebration of The Path. And there is nothing like an ABIOGENESIS party in The Endless Forest! So please accept this last minute invitation to join us in the forest which has been shrouded in mist. Let's bring some color back! If you don't feel like running with the deer just open up the game and follow us in ABIOGENESIS Camera mode by hitting CTRL-W. It'll be wild! We'll probably crash the server! But it's not a TEF party till SOMEONE crashes the server! Please do not Auto-Play + Little site updates. Someone pointed out to me, and I agree, that it can be really unpleasant to browse blogs when there is music in posts that automatically starts playing. If there are more than one of these, in the "Biography" blog section for example, It quickly becomes a cacophony! So, I ask you to please set all your music tracks to NOT play unless someone presses the PLAY button on the player. * On Mixpod.com, just go to the customize tab and click the blue word "Settings". Then select no for autoplay. * If you have a player that is auto-playing check in the embed code and you will see something like: 'autoplay=true'. Please change that to 'autoplay=false'. If I find any autoplaying music in my journeys through the site today, I will change the settings on them as well. AND about that 'Display Name' problem! nope. it's still not fixed. We are dependent on our server admin to help us fix this because Michael and I haven't the slightest idea why it doesn't work. The guy has been a great help with the overhaul of the site on the server side. But we can't monopolize all his time (unfortunately ) He will get to it soon as I poke him about it some more.